Recently I’ve been asked about reports of new research showing the universe isn’t accelerating. If true, it would mean that dark energy doesn’t exist, which would be a good way to solve the mystery. While there is the occasional headline making such a claim, there isn’t a great deal of evidence to support the idea. There is, however, plenty of evidence that dark energy exists. The most recent paper claiming to eliminate (or at least weaken) dark energy showed up recently on the arxiv. It focuses on one keystone of dark energy evidence, the observations of distant supernovae. 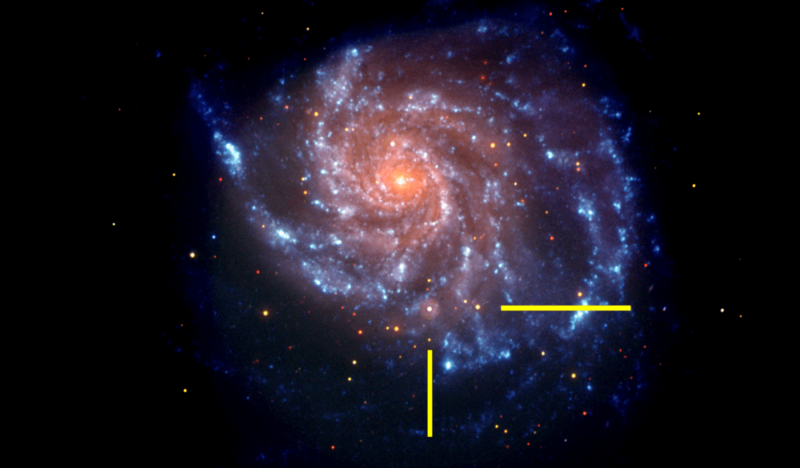 One particular type of supernova known as Type Ia has the useful property of exploding with a fairly uniform brightness. This means they can be used as “standard candles” to determine their distance. Basically you can observe its apparent brightness and compare it to its actual brightness to get a distance. Observation of some of the most distant supernovae at the time led to the Nobel-winning discovery of dark energy. 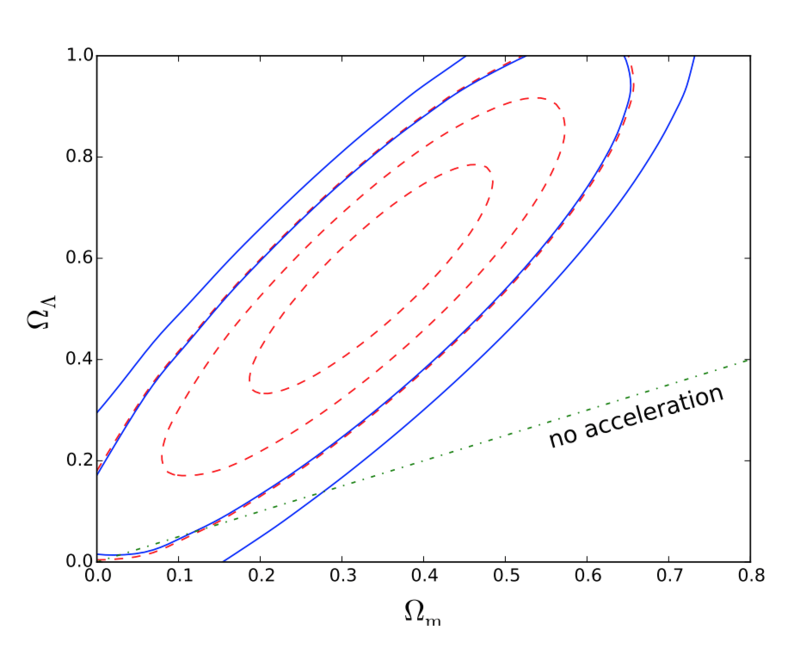 The no acceleration model compared to observational data. But recently there’s been evidence that there is more variation within Type Ia supernovae than originally thought, including a dimmer variation known as Type Iax. This means the uncertainty in the actual brightness of Type Ia supernovae might be greater than we’ve been using, which is where this new paper comes in. Basically what the authors do is analyze the observations we have of distant supernovae using larger uncertainties. They then compare this data to both the accelerating and non-accelerating cosmological models. What they find is that the confidence level of the accelerating model is lowered, which is exactly what you would expect if you make your uncertainties larger. They also find that support for no acceleration increases, which is also what you’d expect with larger uncertainties. Their conclusion is that the non-accelerating model is “still in the game” as it were, since larger uncertainties make the distinction between the two models less clear. But the evidence doesn’t support that conclusion. The strongest candidate by far is still an accelerating universe based upon this data, and dark energy is supported by other evidence such as galactic clustering and the cosmic microwave background. In light of new supernova observations, it’s good to keep testing our cosmological models, but so far the standard LCDM model of an accelerating universe is the best model we have. I’m still waiting for news sites to some day come up with a headline about how “Gravity is not real after all!” after some researcher finds that the gravitational value was slightly different than previously thought. Ty so much for using that typical clear style to explain this. You might not realize, but, the way you write opens up things for non native english readers. None of all those papers come in my language. Yet. The importance of this is not the conclusion. It is to light to overturn a whole model. The importance is the doubt. Standard candles are not proven to be a cosmological constant. And that is something to keep in mind.